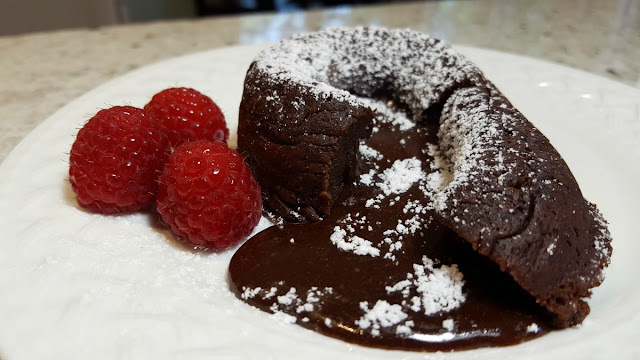 Molten lava cakes are one of my favorite desserts to make and to eat. I love anything chocolate and the chocolaty goodness of these little cakes does not disappoint. The gooey chocolate that runs from the center of the cakes is a yummy delight. I love the portion control of these cakes. I never feel guilty when I eat a chocolate lava cake. Did I mention how easy they are to make? Molten lava cakes are E-A-S-Y! Baking time is the key to success when making these molten lava cakes. First, a little practice is required. If this is your first time making this recipe you may not get perfect results. The reason for this is all in knowing the perfect baking time for your oven. We all know that ovens vary, right? Well, this recipe is very time and temperature sensitive, so you must know your own oven to be successful. 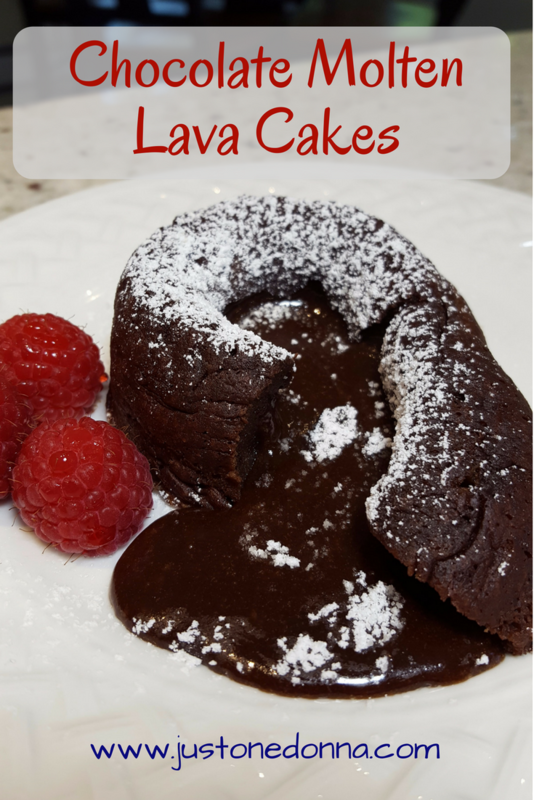 For this reason, I suggest you test the recipe with your oven a few times before you make these lava cakes for guests or a special occasion. You'll also want to have a set of these four-ounce ramekins on hand to make these individual cakes. In my opinion, they are essential for this recipe and have many other handy dandy uses in the kitchen. My Molten Lava Cakes Video, below, will show you just how easy it is to make these cakes. This recipe takes about fifteen minutes from start to finish so practice won't take you long. You'll have fun eating your mistakes, too. Mistakes will taste delicious, even if they don't have the right balance of cake to gooey center. You want your cakes to be cooked to just the perfect balance of cake to gooey center. For me, it takes eight minutes in my oven and two minutes of rest before inverting onto the serving plate. The timing may be different for you, so you must practice. The practice is fun. The cakes taste yummy, even if the gooey center isn't perfect. You'll enjoy your failures! It only takes about fifteen minutes in total to make these cakes, so your practice sessions won't take you forever. Once you get your timing down, you'll be an expert and you'll be ready to wow your family and friends. Preheat oven to 450 degrees. Butter two 4-ounce ramekins and lightly dust the inside of each with cocoa powder, tapping out excess. 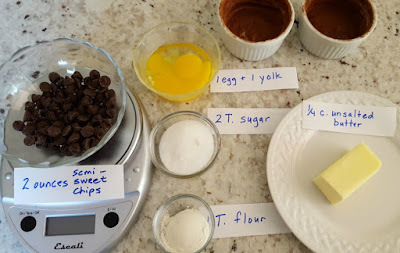 Heat butter and chocolate in a heatproof bowl in your microwave for 15-30 second intervals, until the chocolate is almost completely melted. Meanwhile, in the bowl of an electric mixer, whisk egg, egg yolk, and sugar until light and thick. Slowly add butter mixture to the mixer, add flour and mix until combined. Divide batter between ramekins. Place on a baking sheet and transfer to oven. Cook for 7 - 10 minutes, until the sides are set and the center is soft. Remove from the oven and let rest for 2-5 minutes. Immediately invert onto your serving dish. Garnish with ice cream or whipped cream. Pour whipping cream into a small bowl and whip using an electric mixer until frothy. Add the sugar and beat until soft peaks. Serve whipped cream beside the warm cake and dust the cake with confectioners sugar, if desired. These cakes are so yummy, I know you'll love them as much as I do. If you like this recipe please share it on Facebook, Twitter, Pinterest, or Yumly.